Why choose Pro. Clinics for Wart Removal? If you are searching for a clinic in Bristol specialising in wart removal then you have come to the right place! Pro. Clinics are a specialist non-surgical clinic offering a full range of treatments including wart removal. Warts are a remarkably common problem, and the vast majority of the population will suffer with them at some point in their lives. They are not usually dangerous but they can certainly be unsightly and uncomfortable, so it is hardly surprising that most people are keen to have them removed as soon as they appear. Warts are especially common in children, and at Pro. Clinics we often treat children for wart removal (with a parent or guardian’s consent) and are highly skilled at making the treatment as quick and painless as possible. There are various methods available for wart removal, but the method that we have found to be the most successful is to freeze the wart off using liquid nirtogen. The process is very quick (around 1 minute) and almost painless. There may be a slight stinging sensation, but most people are able to tolerate the process fairly easily. After the wart has been frozen, it can take a couple of weeks for it to disintegrate, although this can sometimes happen sooner. Warts are a very common condition, that a large percentage of the population will suffer from at some stage in their lives. Warts are a hard growth that appears on the skin, which is caused by human papillomavirus (HPV) infection. Although unsightly, warts are not generally considered to be dangerous. They are however highly contagious, so it is not uncommon for one family member to pass them on to another. Warts are often found on just one part of the body (often the hands or the feet), but they can also go on to spread to other areas too. Although wart removal is not strictly necessary, as it is not causing any harm, many people are embarrassed by the condition so are keen to have the wart removed. There are many ways or removing warts, but at Pro. Clinics, we have found the most successful method is to freeze them off using cryotherapy. This is a quick and easy procedure that often produces excellent results. There are many methods of removing warts, ranging from having them cut out, to laser treatment. At Pro. Clinics, we have found that the safest and most effective method of wart removal is to freeze them using a device called a Cryopen. This is a small pen like device that delivers a powerful jet of liquid nitrogen to the wart for 30 seconds, which effectively kills the wart. The Cryopen is a very safe device when used by a skilled clinician, with minimal side effects. Can I have warts removed if I am pregnant? Although wart removal using cryotherapy is a very safe and risk free treatment, at Pro. Clinics we are always sure to err on the side of caution whenever a woman is pregnant. We feel that it is best to wait until the baby has been born before you start on any treatment to remove warts. Can children have warts removed? The method that we use to remove warts (cryotherapy) is a very safe and effective method, and we are able to treat children as long as we have a parent or guardians consent. Warts are especially common in children, so we have a lot of experience in these cases and are experts at putting children at ease both before and during the procedure. Anyone with low blood pressure should avoid the treatment. Anyone with a pre-existing heart condition should avoid the treatment. If the wart is too close to delicate structures of the body, such as the eyes, we will not carry out the treatment. Although warts are generally considered not to be dangerous, they are often very unsightly. Many people are embarrassed about having warts, especially if they are on a part of the body that can easily be seen by others. As well as being unsightly and embarrassing, warts are unfortunately also contagious, so many people are keen to have them removed in order that they do not pass them on to friends and family. During the process, the tip of the Cryopen reaches -89°C. As it produces such a cold jet of gas so quickly, the treatment times are very quick. For wart removal, we generally freeze the wart for 30 seconds, allow it to thaw out and then refreeze for another 30 seconds. As you can see, the treatment is incredibly quick, meaning people are often able to book an appointment during their lunch hour, as they are usually in and out of the clinic in a matter of minutes. What is the cost of wart removal? At Pro. Clinics we charge just £50 per session for wart removal. If a second session is required the price reduces to £30. Can warts be removed on the NHS? Historically, GPs used to offer wart removal on the NHS. Sadly, this is no longer the case and, as wart removal is deemed as a cosmetic procedure, it is no longer covered by the NHS, so you will need to book an appointment with a private clinic if you want to have a wart removed. What can I expect from wart removal treatment? 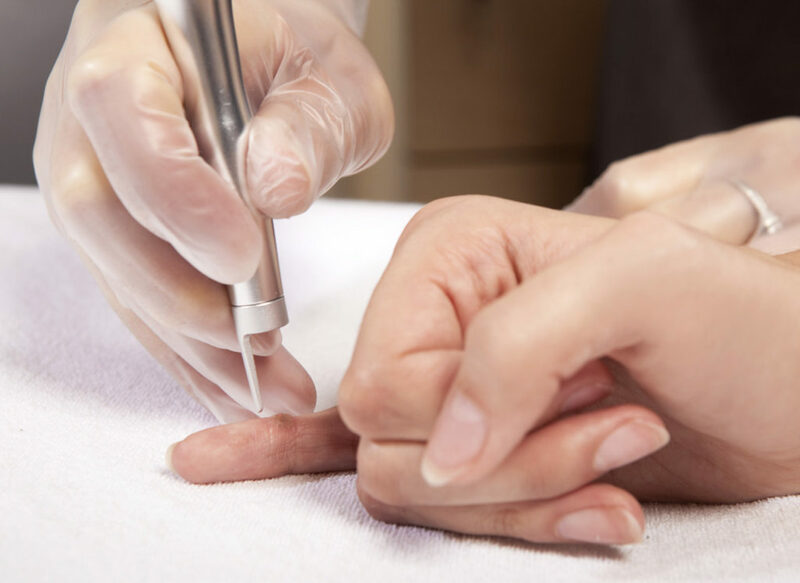 During the treatment, the clinician will point the Cryopen at the wart and spray a very fine, high-powered jet of liquid nitrogen onto the wart for around 30 seconds. The wart will then be allowed to thaw out, before the treatment is repeated. Once this process is completed, you are free to leave the clinic and resume your everyday activities. There is sometimes a slight stinging sensation that can be felt during the procedure, although this is generally fairly mild and most people are able to tolerate the treatment without any major problems. Does wart removal leave a scar? Generally speaking, when a wart is removed by way of the Cryopen, there is very little chance of scarring. As the treatment is so targeted, only the wart is affected by the cold spray, meaning that the surrounding skin is largely unaffected. Is wart removal the same if I have darker skin? Darker skin has more melanin, which is the chemical that causes the brown skin colour. Generally speaking, with any aesthetic treatment, there are more complications when treating a client with darker skin tones and there is more of a risk of pigmentation changes occurring. If the area that is treated becomes lighter after the treatment, the pigment often returns after a few months. How long does it take to remove a wart? Wart removal using the process of cryotherapy is generally a very quick and easy procedure. For warts, we usually freeze the wart for a period of 30 seconds, allow the area to thaw out again, and the refreeze the wart for a further 30 seconds. Sometimes this single treatment is enough to destroy the wart, although in some cases, a follow up session may be required a month later. It is difficult to give an accurate answer to this question, as healing times for wart removal tend to vary from person-to-person. Many clients are fully healed after just a few days, whilst others could take a few weeks before the healing process is complete. Generally speaking there are no specific aftercare instructions to follow after your cryotherapy session, apart from keeping the area as clean and sterile as possible to avoid the risk of infection.